Crested walking stick badge (including pins). Driftwood annotated with Mumbles Langland Cwtch Each piece of driftwood is unique so may differ from the one pictured. Bone china mumbles railway bell with tram and rail line. 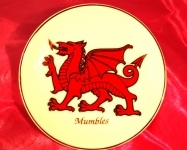 Mumbles book mark with dragon motif. Mumbles plaque with 2 beach huts made in Swansea from Welsh Oak. Measures height 9.5 cm x width 25cm.